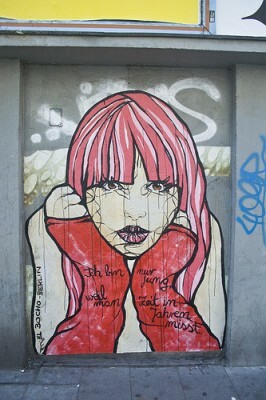 Since the reunification of Germany, Berlin is considered to be one of Europe’s street art strongholds. 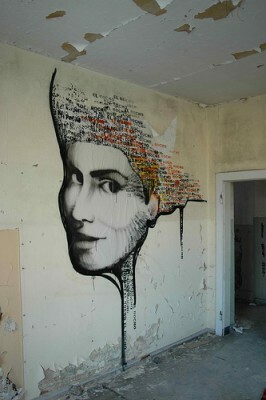 I use “street art” advisedly, as this medium is not to be confused with territorial, gang or vandalistic style graffiti. This sort of street art is more a way of communicating socially relevant themes of everyday people in ways that are informative. This describes El Bocho’s style of street art to a T.
While watcing an episode of Bizarre Foods with Andrew Zimmern recently, it was his interaction with El Bocho which caught my attention. El Bocho likes to keep his identity hidden from the media in all forms…sometimes going so far as to wear a mask made out of tape. If you have the opportunity to watch him at work in person, that is one thing, but if the cameras are “rolling” then you’ll notice he turns profile or dons his hood. I like that about this guy because his art isn’t about “him”. He doesn’t want his persona to be the center of attention, but he wants his work to have a voice and he wants his work to have the preeminence. El Bocho is best known for his tape and poster street art, but he’s now dabbling in tiles and in all of these mediums, he’s considered a pioneer. 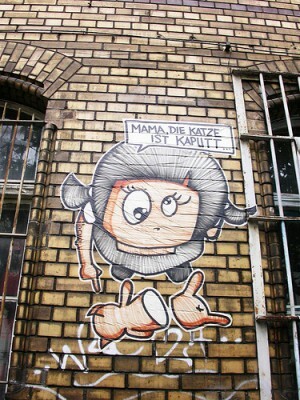 It seems the street art scene is alive and vibrant in Germany, but what I like about my man El Bocho is that he brings a sophistication to the look he plasters on buildings. This causes his art work and message to stand out from among the rest –a message which the German government does not have the same appreciation for. So, what is El Bocho’s message? I have to tell you that I cannot find a cut and dry neat little package to deliver to you as to what he stands for. This too, has won me over. He uses his art to speak and that’s that. 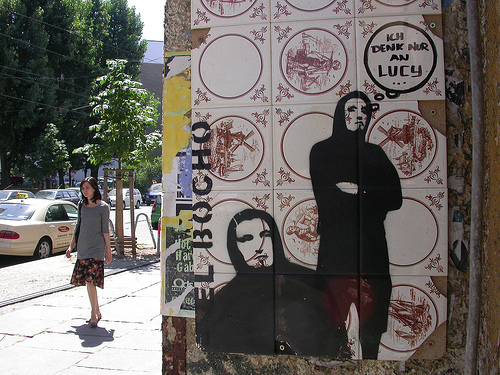 If you notice when you visit his website…very little is written about the “man”, El Bocho. Who he is and what he believes… is in his art. And so, since he leaves the interpretation of those beliefs to the individual viewer, I too will leave his artwork to your private interpretation and not dirty it up with my own opinion. 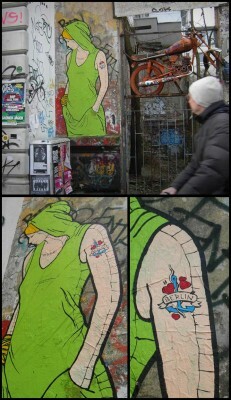 You’ll notice as you view the Gallery of images that El Bocho has created several characters which appear all over Berlin. 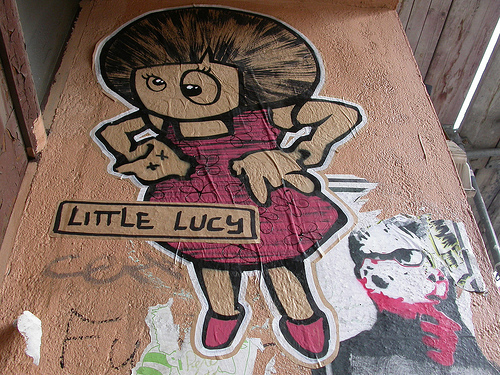 One, is Little Lucy. Little Lucy kills cats. Among other things, she slices them and hangs them and puts them in toasters. I’ve poured through website after website and forum after forum and I CANNOT figure out what the deal is with Lucy and Cats. I know that Little Lucy was a character in a 1970′s Czech TV Series, but in my quest to find out why she has taken to the streets to rid the world of cats, I’ve come up with nothing so far. 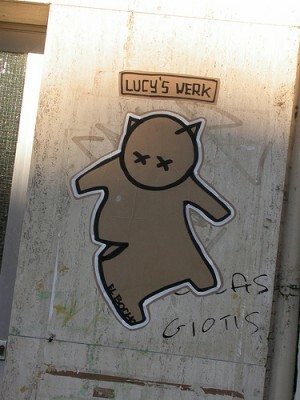 I’ve translated more than 50 articles in my quest to find out what Little Lucy has against cats…only to come up dry. When I find out, I’ll post my findings and if you happen to find out before me, then please stop by and clue me in. Thanks! You’ll also notice as you view the pictures that there’s a set of Surveillance Cameras which actually have names…they are Kalle & Bernd. 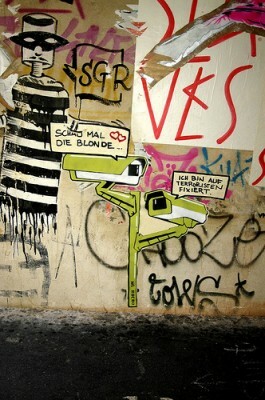 They seem to represent the eyes of Big Brother and they too, are all over Berlin and other big cities in Europe. Apparently street cameras are not uncommon in Berlin and as El Bocho’s art is a reflection of what the man on the street thinks…I get the idea they don’t like that these cameras record their activities. I’ve included several videos as I think they add layers and dimension to the personality of this hooded artist. He was commissioned by CNN’s Go Beyond Borders Tape Art Project at the end of 2009 to help celebrate the tearing down of the Berlin Wall. His artwork played a significant role in presenting a storyline of the events leading up to the bringing down of the Wall which divided a country. 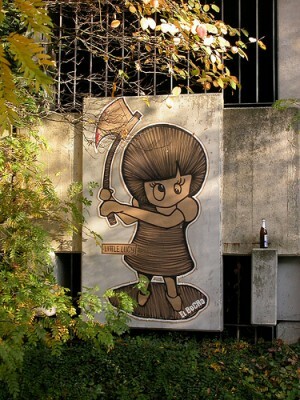 El Bocho also takes part in activities which promote the mission of a group called The Wallbreakers. This is a band of street artists who are determined to keep the ideals which brought the Wall down ever before the eyes of the public at large…as they don’t want to see another one erected…ever again. Feuerwear, is a company in Germany which recycles old fire hoses. They asked El Bocho to design a line for them which then went on display as art and was sold for a limited time. This artist seems to be a man with a conscious who uses his celebrity status to further only ideals which fit his own. I hope you’ll find his work as intriguing as I have. Drop me a line. Tell me what you think. I conceive this website has got very good composed content content . Enjoyable post. I’ve just sent the link to my cousin|. Undoubtedly a questionable l ist.Both Aol and Nickelodeon do notdeserve to become inside the greatest redesigns,in my opinion.Number one redesign would have to be the City of Melbourne logo.